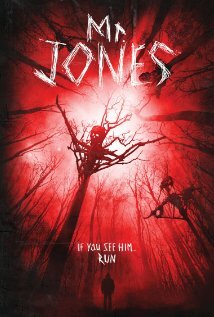 Mr Jones is one of those low budget fright movies that allows a brief glimpse of the very good idea that lies at it’s heart, shortly before driving it into oblivion with a stack of ‘seen-it-all-before’ cliches. 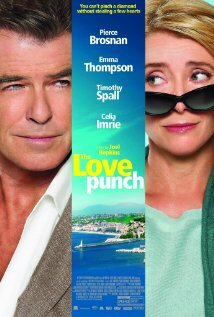 Unusually, this one starts unpromisingly, gets really good for about twenty minutes and then goes right off the boil, to the point where it’s a real challenge to stick with it to the bitter end. Scott (Jon Foster) and Penny (Sarah Jones) are a pair of young film makers with a relationship that has drifted into the doldrums. In order to try and fix things, they take the unusual step of heading off into the wilderness for a whole year to see if they can ‘find’ each other. To make matters even worse, Scott decides to film a daily log and even devises a camera that can film the two of them simultaneously. (This will prove handy later on when things get nasty for them, but doesn’t always convince as a cinematic device). When a mysterious hooded hermit steals Scott’s rucksack, the couple go in search of it and find the workshop of ‘Mr Jones’ a mysterious clandestine artist (think Banksey only with weird sculptures) and quickly decide that the best way to rescue their relationship is to shoot a sneaky documentary about him. Because that makes perfect sense, right?Scott heads back to the city to invite various art experts to comment about Jones’ work (this is where the film all too briefly becomes rather interesting.) On Scott’s return however, things get uncomfortable as Jones starts hanging around the couple’s backwoods cabin, acting in a threatening manner. This is where the film blows it all with a succession of (supposedly) creepy scenes of the silence, silence, silence, boo! persuasion and the story’s ultimate ‘twist’ (Jones’ identity) surprises absolutely nobody, since we all guessed it ages ago. The shame here is that this could have been a lot better than it actually is. In his private life, Roman Polanski has incurred the wrath of many people. He’s also the cinematic genius who created masterpieces like Repulsion, Rosemary’s Baby and Chinatown. It’s often hard to weigh these two truths against each other. Can we really judge him only on his work and conveniently blank out what he gets up to in private? You’d have thought that in his current state of disgrace, he’d stay well away from films of a questionable sexual nature, so what are we to make of Venus In Fur, a movie whose very raison d’être is to stir the murky waters of human sexuality? Based on the play by David Ives, it’s a two-hander, which is played out in a deserted theatre and as with his previous movie, Carnage, Polanski has made no real attempt to ‘open it up’ for cinema viewing. To further cloud the waters, the film stars Emmanuelle Seigner (or as she’s sometimes know, Mrs Polanksi) and Mattieu Amalric, an actor who bears a strong physical resemblance to the director. What was Polanski trying to say here? Is this intended to be some kind of vindication of his personal life? It’s hard to say but surely these things cannot be mere coincidences? It probably wasn’t a great idea to come out to this when we were supposed to be sorting out the new flat, but hey, Dylan Moran is top of the bill and when did we last get the chance to see him in a gig as intimate as The Stand? So off we troop, early enough to get seats at the front and a couple of drinks later, the event kicks off. JoJo Sutherland is our host for the evening and she’s brash, confident, good at milking the crowds for material. She swigs at a pint all the way through and swears enough to make the proverbial navvy blush and then introduces the first act of the evening. Eleanor Morton stumbles on stage holding a ukele and delivers a great set that’s built around her supposed inability to communicate with others. It’s toe-curling stuff, expertly put together, though it’s clearly not to everyone’s taste – a couple sitting across the stage from us don’t crack a smile throughout. This is Marmite comedy, you’ll either love it or hate it and I fell into the first category. I’m sure we’ll be seeing a lot more of Eleanor. Next up is Ally Houston, who could be Eleanor’s perfect partner, judging by the persona he adopts, a gormless social misfit with a guitar, some truly awful lyrics and (disturbingly) a plastic doll sellotaped around his waist, to whom he dedicates a couple of songs. Once again, the couple opposite us clearly aren’t getting the jokes at all, but Houston is walking a tricky comedy tightrope and is surely a name to watch in the future. I felt a bit sorry for Chris Martin (not that one!) who after all the weirdness somehow came across as a bit ‘safe.’ He was perfectly pleasant and delivered his routine with confidence, but it all felt a little too familiar and, dare I say it, not as edgy as we might have expected at this venue. And then it was time for the headline act and out shambled Dylan Moran, a little chunkier than I remembered him (aren’t we all?) and still maintaining the persona of a man who has had a few too many red wines before stepping onto the stage. I’ve never been sure if that’s just an act he puts on or whether it’s genuine (he was certainly drinking red wine throughout this performance) but I do fondly remember being in stitches at some of his earlier appearances and I’m also acutely aware that tonight, he seemed unfocused and sloppy and (dare I say it?) slightly out of tune with contemporary tastes. A routine about the ‘Asian lady inside him’ felt uncomfortably like borderline racism and his long-winded tirade about the pitfalls of buying a decent cup of coffee in Starbucks seemed frankly, too easy a target. That said, there were a few moments here, when you briefly glimpsed the brilliant raconteur he once was and I’m sure, could be again. If appearing at The Stand is a prelude to him returning to a tour of bigger venues, then he really needs to hone his material more carefully,jettison anything that comes across as lazy and concentrate on the surreal observations that have always been his greatest strength. An interesting night and one in which the newer names shone brighter than the actual ‘star’ of the show. 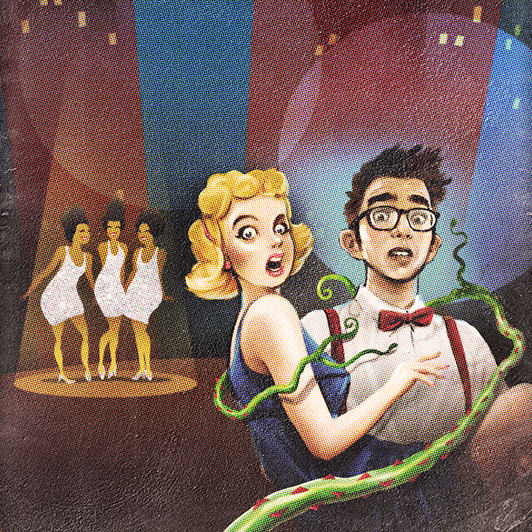 As guilty theatrical pleasures go, Little Shop of Horrors is right up there with the very best of them. I first saw Howard Ashman and Alan Menken’s musical in the early 80s at Manchester’s Library Theatre and I’ve been a devout fan ever since. To my mind, it’s the perfect blend of great songs, weird humour and 50s-style science fiction (and let’s face it, you don’t find many of those!) While it might seem an unusual choice for a Christmas Production – where’s the tinsel, where’s the saccharine? – the Royal Exchange are on to a winner with this superlative show and if the idea of a Christmas musical is to create joy, then this does so in spades. It had the audience securely wrapped in its tendrils from the opening bars onwards and never let go. LSOH is, of course, ubiquitous, beloved of school drama and amateur dramatic societies alike. There’s a reason for that. Most musicals have one or two memorable songs, but in this, every song is memorable. It’s so expertly put together that it’s hard to make a really bad version of it (little wonder that Ashman and Menken were soon snapped up by Disney.) The Royal Exchange have come up with a note-perfect production, cleverly staged and directed with brio by Derek Bond. The role of Audrey is pivotal and Kelly Price makes this her own, her superb voice ranging from delicate and plaintive in ‘Somewhere That’s Green,’ to strident and soaring in the show-stopping, ‘Suddenly Seymour.’ There’s wonderful support from the 10-strong role-swapping cast (at times, it seemed that there must be thrice that number.) The fact that the musical is played ‘in the round’ means that the various manifestations of Audrey Two require onstage puppeteers, but it matters not a jot – in fact, special mention must go to head puppeteer Nuno Silva, who as well as manipulating the (eerily convincing) ‘mean green mother from outer space’ also provides him with a voice that would do Levi Stubbs proud. Of course, there has to be a big ending and trust me, this production has one. It would be unfair to reveal any more than that but suffice to say that the usually austere Royal Exchange crowd made their feelings known, leaping to their feet to deliver an enthusiastic standing ovation to a clearly delighted cast. The musical’s run has been extended by two weeks and I’m told there are still a few tickets available, so if you can get hold of some, I would urge you to do so. This is unadulterated theatrical joy and like most of the audience, I came out singing. Simply the best Christmas production involving a man-eating plant from outer space that I have ever witnessed. Miss it and weep. The Old Vic theatre company, as directed by Yoel Farber, takes on Arthur Miller’s near legendary play and arranges to have it beamed to a cinema screen near you. What’s not to like? Particularly when the interpretation is as compelling as this version, which stars Richard Armitage as a brooding, macho John Proctor and Anna Madely as his much put-upon wife, Elizabeth. The play of course, centres on the Salem witch trials, a device that Miller originally employed as an allegory about the McCarthy witch hunts of the 1950’s. Here the characters are compelled to talk in strong Lancastrian accents – possibly to evoke comparisons with the fate of the Pendle witches, or perhaps to point out that witch hunts can happen just about anywhere? I’m not entirely sure of the reasons behind the decision, but the fact is that it works brilliantly, making Miller’s ageless dialogue sing in a way I’ve never heard it before. In a note perfect cast, it’s hard to single out highlights but Adrian Schiller’s take on the difficult role of beleaguered cleric, Reverend John Hale, is a particular delight; and how amazing to see William Gaunt as the white-haired and irascible Giles Corey, evoking fond childhood memories of watching him play a young superhero spy in The Champions; what a decade-spanning career that has been! The standout scenes are the ones in which the ‘possessed’ girls, under the tutelage of Abigail Williams (Samantha Colley) crank the volume up to eleven. It’s powerful stuff this, and time has not dulled its cutting edge. Proctor’s final ‘confession’ is frankly the stuff of heartbreak and a demonstration of the way in which religion can be turned to support the forces of evil. A superb production and a rare opportunity to see the Old Vic in all its glory without paying for train tickets to London and a night in a hotel.